Aug Cruise - 2013. Weston to Ilfracombe and Watchet. 10 days ! Sat 10th Aug - Tuesday 20th. Some friends at Uphill wharf join me for a trip to Ilfracombe for a few days. We decide Swansea is out as with the wind firmly in the SW - I should have realised this applied to Ilfracombe as well. It turned out to be a trip fraught with problems and wrong decisions. Lessons were learned though - but I don't like learning lessons when one crew has never sailed before ! As soon as we were off Minehead I realised we were not going to make Foreland early enough - big chop in the nose slowing the boat, and I still had overheating problems. I aborted here - and we had a pleasant hour or so under canvass sailing inshore ad pottering along to Porlock Bay. We should here have called it into a day sail and returned to Uphill.
" Hell, its only 6 miles to Foreland and we are 1 1/2 before LW - we could make it. Once past, we would have the reverse tides of Lee and Woody bays etc." We go - big mistake. We keep trying to get around Foreland - bigger mistake. We are eventually clear of Foreland by 1 hr into the next tide. However - there is no real tidal advantage until wll past Lynmouth. We are running into chop around the headlands and adverse tide. To cut a long story short - we reach Copperas by 8 pm ! Weather is now worsening with squally rain and some evil looking storm clouds. Light is failing. However - its now so late we are nearly into the next HW - so actually progress around to Ilfracombe - Rillage Point etc was an accepable 5 kt dash on the engine - nav lights on we hit Lifracombe at dusk, I was here two week previous but I didn't really recognise the distant harbour. Seemed very different at dusk. Thank god the engine kept plodding on that last hour. We should not have put outselves in this position. Not good - and in hindsight, pretty stupid ! Anyways - we were in and moored up in the outer Harbour visitors buoys. That great 'haven' feeling - hard to describe to anyone who has not done it. 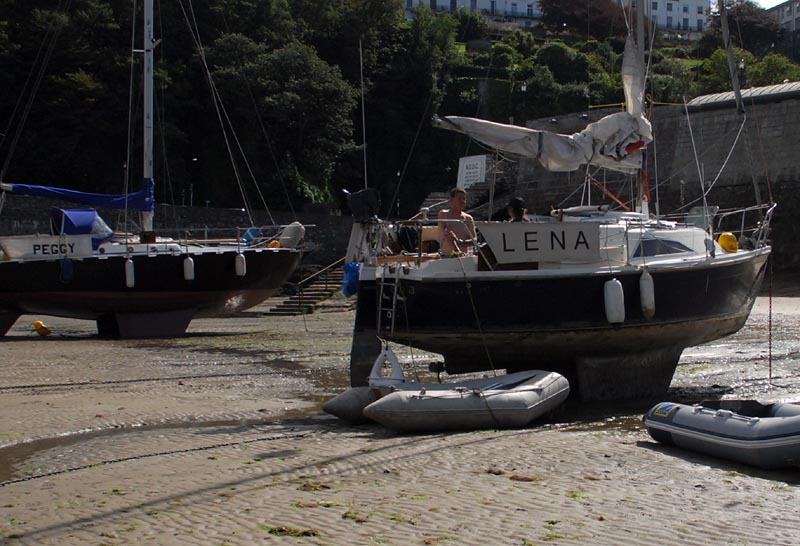 Lena in the outer harbour at lfracombe. £9.60 a night - nice flat sand - but if there is a swell coming in its a bit bumpy until you float clear ! Cleaned the bottom and cleaned off the intake grating - which seems to be the cause of the overheating. This glorious windless day we should have left and got back ! As it was we stuck to our original intention of drying out the boat and cleaning ad inspecting the botton and the intake grating. A great day - and the intake was badly fouled with barnacles - as was the whole underside. I had gotten most off at the Mumbles - but couldn't get to the underside. Had we left earlier at Swansea to go over to the Mumbles - all this could have been done then ! 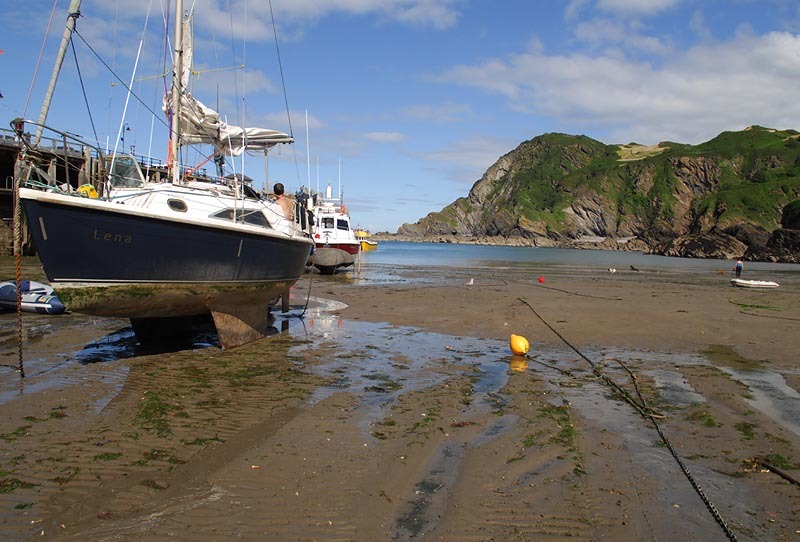 We chose to return the next day and anchor at Blue Anchor bay. Another bad call - but M had to get back before important medication ran out. We should not have left Ilfracombe - and should have taken some steps than to aquire emergency drug supplies maybe. We leave - anchoring off in deeper water until nearly LW. Very bad swell - still a SW 4-5. We stay inshore untill LW - very large building seas. At Highveer point it was very rough and confused. We should have been further off I think. Foreland Point was actually rather impressive - with huge rolling seas coming up behind us, breaking white water alongside ! But it was steady and all going the same way. We tried to get into Porlock for some solace but it was evil - so worked our way back out, which was difficult. Our planned anchorage at Blue anchor was no go - right in to 6 m we were being tossed about all over the place. In desperation I checked the Watchet gate times. Again - I should not have had to do this. This should have been No 1 on any passage plan - port of refuge, times, HW etc - access times. Again lessons learned. HW Watchet was 2240 - you 'can' get in 2 1/2 before approx but not recommended. I should have hung around in the messy but relatively safe Blue Anchor bay until we were 2 hrs before or more. 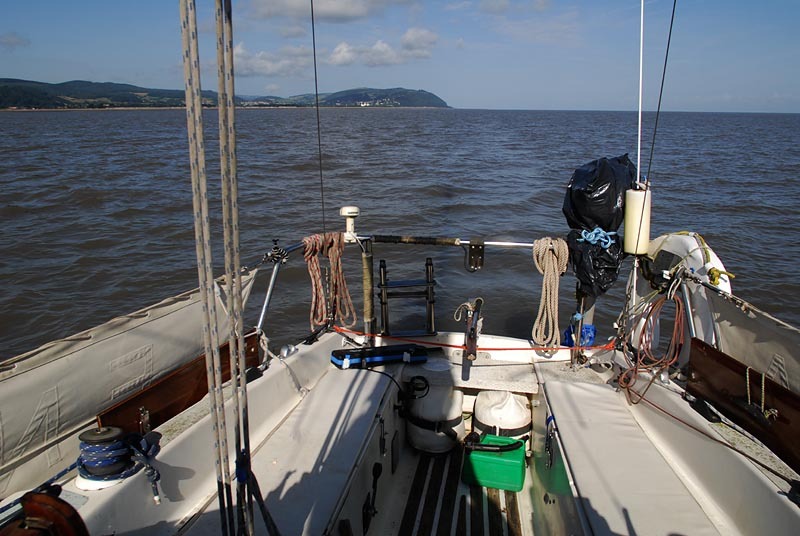 But we pressed on so were 0.5 miles off Watchet at 2020 approx - it was not sea to hang around in - so I made an approach. I knew we had to keep a straight track in with the piers 'just' open. You don't want to be seeing an open entrance - you are way too far over to the east side, which is wall and rocks. Basically the entrance faces East -but you approach from the North. I went for it - had 5.5m in on the approach. Very rough water - andrenalin is a good friend ! Got it right but my hat blew off last minute - 3.5m at the entance. 2.5m in the outer harbour. Its a rocky shore - that was cutting it fine. Not much room for error. 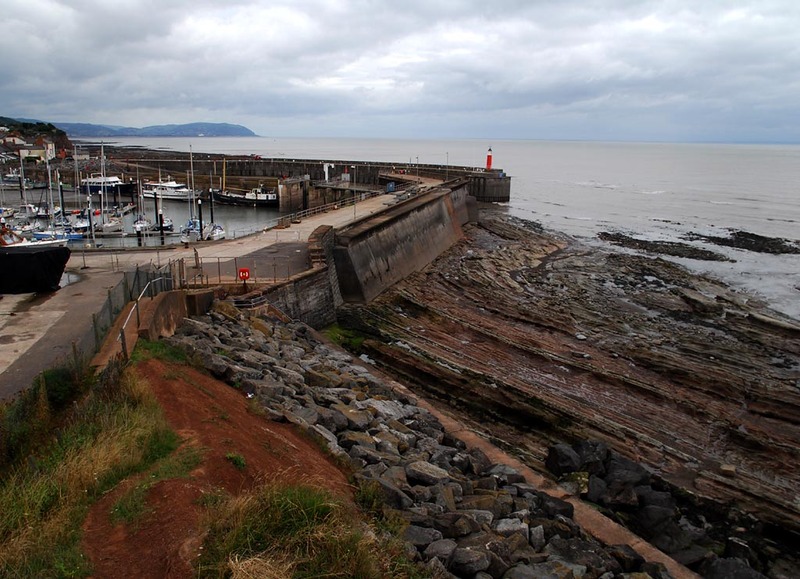 The entrance at Watchet - it faces east and one approach from the north. Its very rocky to port coming in - so you have to hold your line to the outer pier. M - had to be back in Uphill for Wed at the latest so as to be able to get home for his supply of tablets (serious stuff ) A friend in Williton agrees to give them a lift to Taunton - to get a train home. I opt to take the boat home alone. 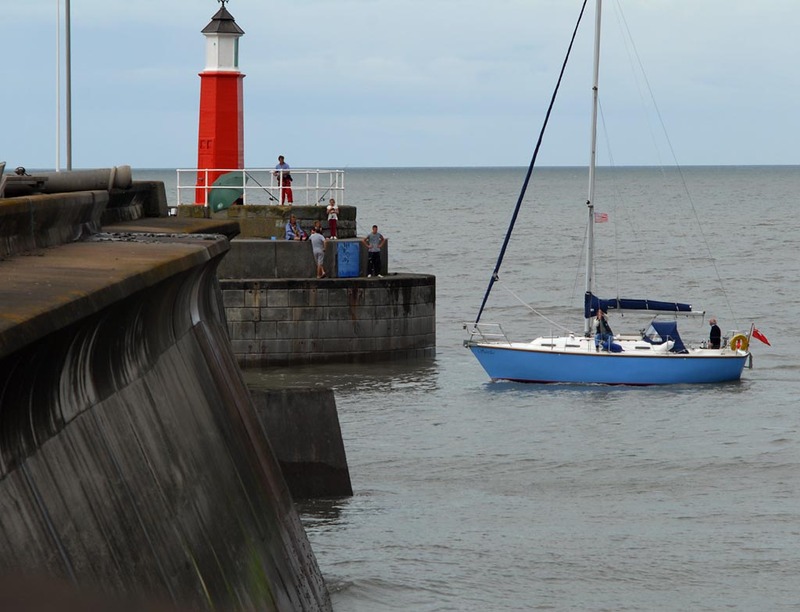 After a couple of days relaxing I realised that Watchet was a difficult place to get out of if going up channel. I needed to leave at LW for Weston. HW was around midday - so either it was going out at night and anchoring at Blue anchor - or at midday and going up the next morning. Maybe I should have run up to Barry - but I wanted to stick with what I was familiar with. Another misake maybe ? 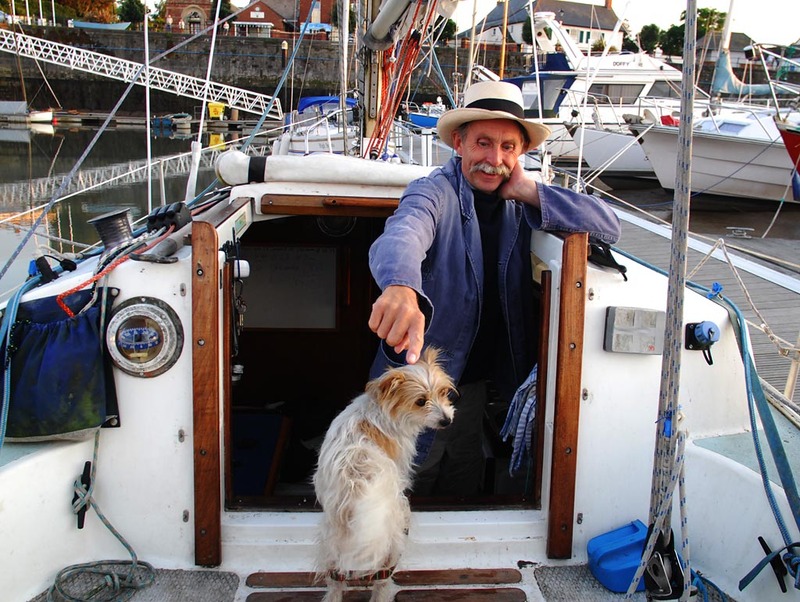 My old friend Partick Cook - proprietor of the early Plastic and Bakelite Museum in Willition - just up the road from Watchet. The weather then went bananas - with a gale 8 at Lundy for several days. I chose to stay put. By Monday there was signs of high pressure building - still squally though from the SW.
Tuesday proved to be the day - and I was off. Anchored in Blue anchor around 8.30 am and waited around for LW. Fine clear day - hardly a breath of wind. Not a cloud in the sky. A lovely morning at Blue anchor bay - anchored in 10 m, giving me 5 at LW ( its a very flat beach ) Hardly a breath of wind - worse was to follow ! Looked goof for the day - how wrong one can be ! Set off for DZ3 - wind started to pick up from the west. By 5 miles short of Steep H it was building up large boiling sea. It was a 13.6 m tide at Avonmouth - and it was all coming through here it seemed ! Just short of Steep Holm it worsened to a boiling mess. I put up the jib full - to keep some control and sort of survived until off Brean Down - when I was just swept and surfed into weston Bay like some wet fairground ride. Worst conditions I had ever been in - and it ll started so balmy calm ! Thats the Bristol Channel giving you a calling card ! Into Weston Bay at about 4.20 pm - HW was ten past seven. I killed time sailing from Brean down to Birnbeck pier on the jib with a bit of engine ticking over. It was now a pleasant evening - a bit of a swell rolling in but quite enjoyable really. Up the Axe at about 6pm - no problems, biggish tide. Got her in on the berth first time and moored her up on my own. No-one around - a bit breezy but didn't embarass myself too much ! So glad to be back - stayed aboard and slept well ! 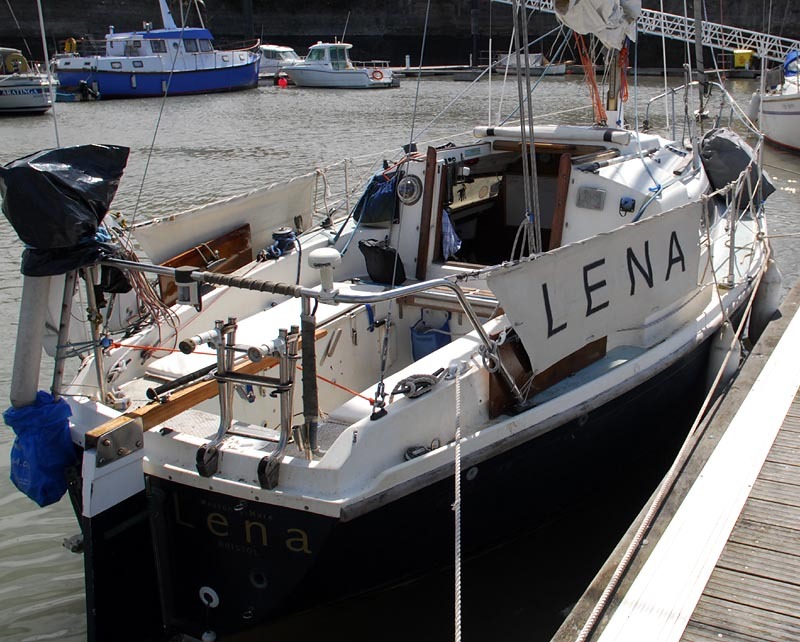 Lena in Watchet marina - I was here quite a while. Nice berth too ! Geoff - Bristol Aug 2013.